UN Secretary General Kofi Annan has unleashed a thinly veiled attack on President Bush, his Administration and the Australian government for showing a “frightening lack of leadership” that is hindering the fight against global warming. Speaking at the start of the main session of the UN climate change conference In Nairobi, Annan described the build-up of heat-trapping greenhouse gases as an “all-encompassing threat” to the world. He said that the Kyoto protocol, was a crucial step in tackling the problem, but that the US and Australia had refused to sign it. 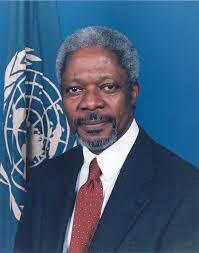 “They [the US and Australia] have to be in step with the rest of the industrialised world”, Mr Annan said. “They have a responsibility to their citizens and to the rest of the world”. But few expect the US, represented in Nairobi by Paula Dobriansky, under-secretary for global affairs, to change its stance. That is one job the new Congress in January has to do. The world cannot wait for Bush to leave office, before the US acts..